Fortunately for those deceiving the general public about a sketchy cancer diagnosis, Meghan has no plans to return to the show full time. “It was a cameo”, the source confirmed. After 3 tumultuous seasons on RHOC, Meghan and Jim are enjoying life off television. The couple certainly has their hands full. Having one kid is no joke but adding twins is when you really develop ninja skills. Filming the show took a “massive emotional toll” on the mom and she often found herself “engaged in situations and circumstances which can be contentious.” This sounds vaguely familiar. I will always fondly remember Meg for her lack of a hobby sleuthing skills. Just think, she could have helped us with so many questions from last year. For instance: Does Gina Kirschenheiter’s estranged husband actually exist? Is Vicki Gunvalson guilty of breaking girl code? Does Kelly Dodd participate in activities that could cause recurrent sinus infections? We may never know the answers, but I feel certain if Meghan were still on the show, she would be the one to find out. 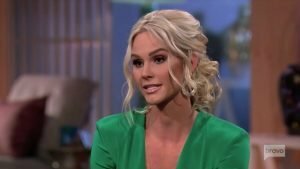 TELL US – ARE YOU GLAD MEGHAN EDMONDS HAS BEEN OFF THE SHOW? DO YOU MISS HER FLAIR FOR INVESTIGATIVE REPORTING? DO YOU WANT HER TO RETURN?